I’ve been crazy busy MAKING a ton of fun projects and recipes! I’ve been on a roll and have been having so much fun! 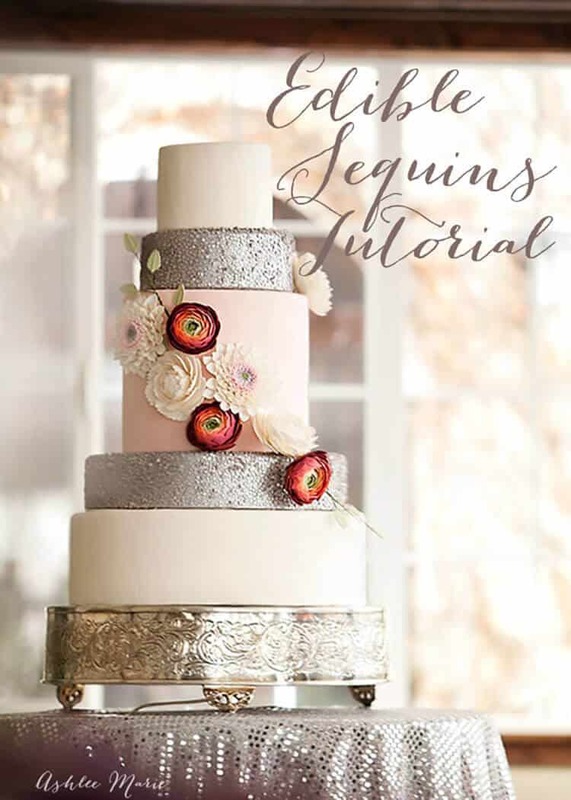 I have so much to share with you, and I’m starting with sharing the tutorials from this silver sequins and gumpaste flowers wedding cake a few months ago! Sequins today, flowers up next! 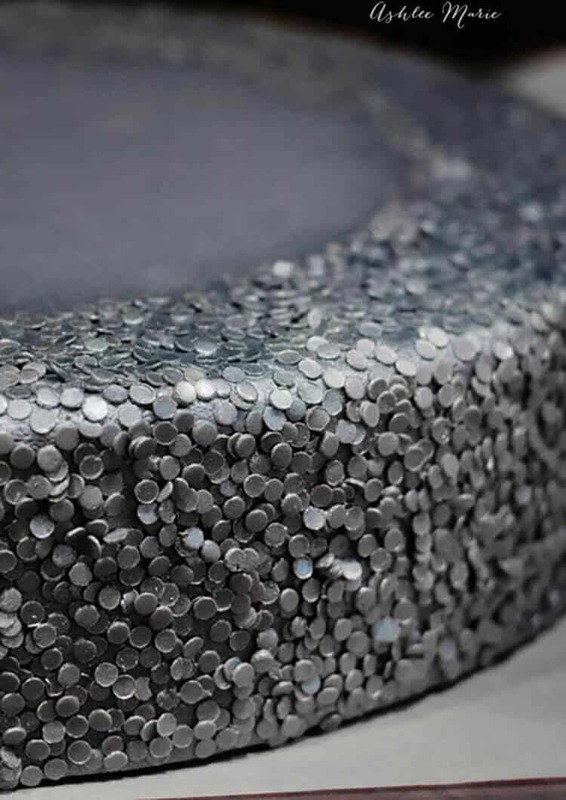 I have been in LOVE with the metallic cakes, especially the sequined ones, I’ve seen all over Pinterest. So when the opportunity arrived to design my own cake I couldn’t WAIT to give it a shot! So first I tried rolling out a gumpaste/fondant mixture (white). Then I tried airbrushing it- no bueno, the silver spray paint was like BLUE, NOT silver like I wanted. 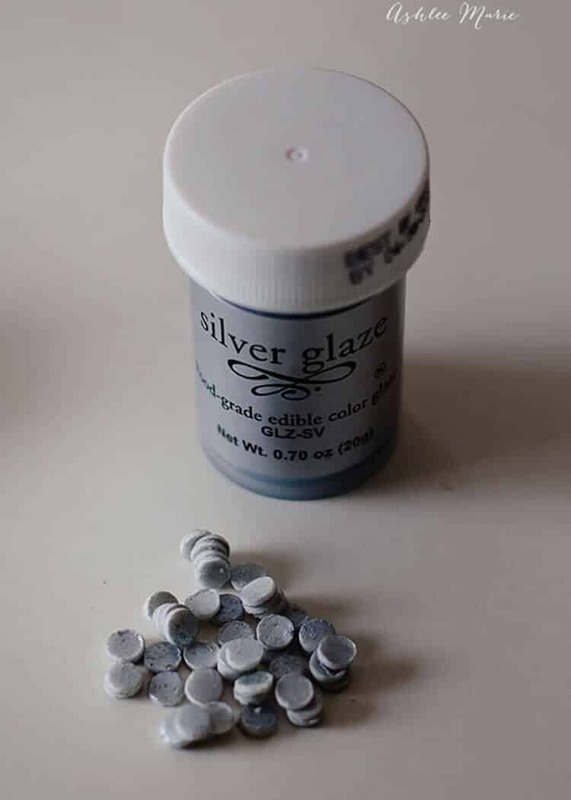 So NEXT I rolled out more white and painted it with this silver glaze. It was a nice shade of silver with a great shine. BUT the problem with the glaze is trying to paint a second coat messed up the first coat, but I didn’t love just one layer. BUT I continued on, I let it dry then cut out a ton of circles using a round tip. FAIL – 1. it took forever, and they kept sticking together, and 2. the edges were WHITE, I didn’t want to take the time to paint each edge, boooo, so nope. FINALLY inspiration hit, what if I put the sequins ON the cake then sprayed them? I still had the problem with the airbrush silver paint looking BLUE. So instead of spraying WHITE fondant/gumpaste I decided to try GREY gumpaste/fondant. ALSO to counteract the BLUE in the silver I added a BIT of red and gold (orange-y counteracts blue). Then I rolled out three different shades of grey, then spray painted the samples with the plain silver, a little of the red/gold and another batch with more red/gold. Then I took them outside and decided which look I liked the best (I liked the medium grey with the silver with just a TAD bit of the red/gold. WINNER! Now came the time consuming part. 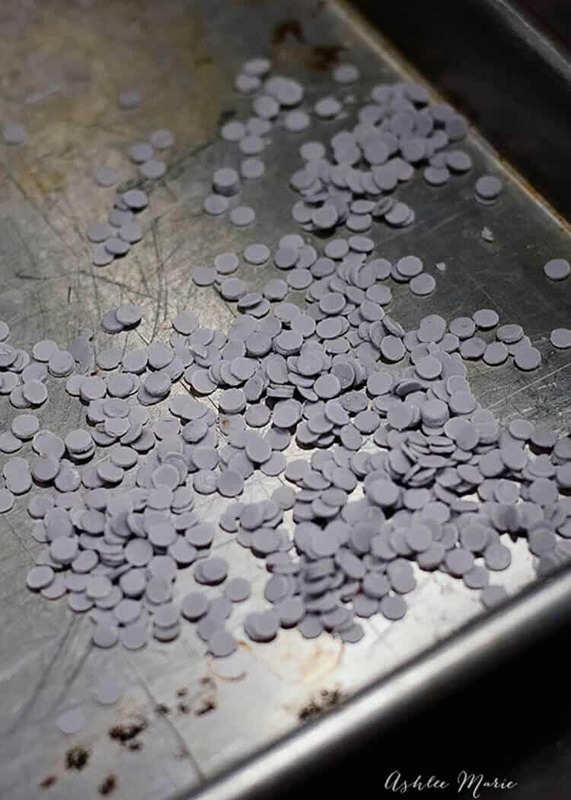 Mixing the gumpaste/fondant mixer, dying it all grey and then rolling it out into a TON of sheets and cutting out MILLIONS of circles. I started rolling out multiple sheets, letting them dry a bit, flipping, then drying a bit more. Then I stacked the sheets so I could cut 4 at a time. My finger still KILLED by the end AND it took so much time I spend a few DAYS doing this and still wish I’d had more. ANYWAY. Once you cut them out, spread them out and let them dry. Next up cover the cakes with the same shade of fondant, then to get the fondant tacky you can either brush it with clear vanilla/vodka OR I ended up using my steamer on my cake to get it tacky (love my steamer!!!). I steam a section at a time then using the same technique as this sprinkles cake I cover it with the circles working my way around. Pressing it into the cake a bit (that’s where the fresh fondant on the cake but dried circles works best). I will say that this is the same color of fondant, the dried circles faded, the result is still great. I wasn’t happy with one layer so I let it dry, steamed it and did it again. I WISH I had enough circles to do a THIRD round. BUT alas, I didn’t have enough. I will for SURE do more next time, esp the edges. I think vodka would work better than the steam, I’ll try that too. THEN I used the silver (with a BIT of red/gold) and airbrushed the whole thing! YAY, It’s starting to come together!!! I love how it colors the sequins AND the fondant underneath. Second layer of airbrushing! LOVE!!! It’s not QUITE as glossy shiny as I wanted, but I am SOOOO happy with how it looks! The end result is to DIE for and the whole cake looks AMAZING! I can’t wait to try it in gold as well! Maybe a bronze? What do you think? What tutorial from this cake do you want to see next? Stenciling on a cake? Or the Peony’s, Ranunculus or Dahlia’s? of COURSE you can move here and have me make cakes for you! I would love that! or just take my online classes and make your own. It’s really not as hard as it looks, just time consuming! I just viewed your beautiful sequin cake. I have an easier solution for you that I just discovered on youtube. Look up Savannah’s Custom Cakes. She uses those premade confetti candies that come in multiple colors. 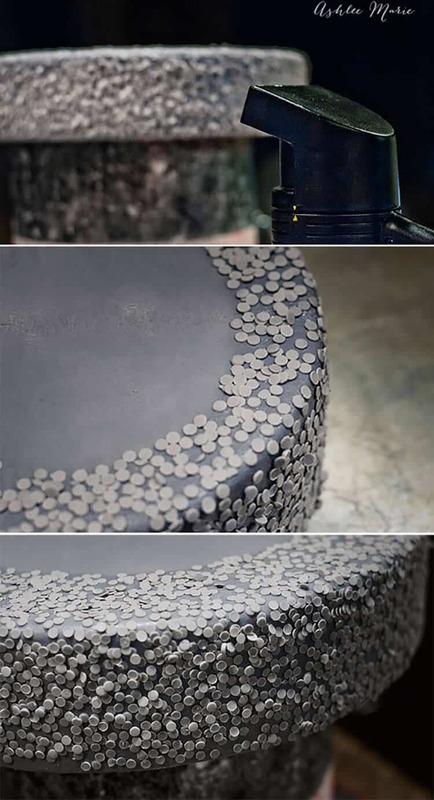 She puts piping gel on the cake to be sequined, then uses handfuls of the confetti, once it dries, she uses vodka and dust to paint on the metallic color. It looks just like yours only now you won’t have to hand cut all those tiny circles. I hope you will give it a look. thank you, I’ve seen it done that way before, but I found this to be a better fit for me, which is why I’m sharing it. I thought it took WAY longer covering all the colored confetti with coat after coat of paint. Umm.. this is seriously the raddest post I’ve seen in such a long time! I freaking love these! Thanks for sharing! P.S. I am totally bummed out that we didn’t get a chance to meet at snap! What the heck? awww thank you so much! And why DIDN’T we meet at SNAP? CRAZY, hopefully you’ll make it to one of our Utah Blogger nights and we can meet IRL! Like I say in the tutorial I simply use a round piping tip! Any size works depending on the size sequins you want! I used an 8! Wow! Where were you 16 years ago when I got married. I would have loved this for my wedding cake. You are incredibly talented! Where was I 14 years ago when I got married! I wish I had this talent and had made my own cake!!! Cakes are so much more fun these days! Awww thanks! It is a really fun technique and while it’s time consuming it’s totally worth it for the end result! Ashlee, this is seriously fabulous and that cake is beyond words! Totally loved reading about your process and the results are stunning! Would love to see the peonies, my favorite flower! Thank you so much for sharing! Thank you so much! I’ll start sharing the flowers this week! I’m so glad you like the cake and tutorial so far! Awww thanks Lindsey! I’d LOVE it if you wanted to take my classes! I’d love to see what you do with the techniques! It was so nice to meet you at snap! Thank you so much! I really love what I get to make and create! Isn’t that why we all love to do it? see what we can make with our own two hands? love the new haircut, I cut my own hair too!!! It was great meeting you as well! hopefully our paths will cross again! This is gorgeous!!! How much do you charge for a cake with that technique?? honestly? I’ve never done it for a paying wedding cake, but I would charge a LOT because of the time, at least an extra $1 per serving for that tier. Hi!! Such a lovely and unique cake!! What did you use to cut the circles? Did I completely miss that?!? It was a frosting tip, whatever number you want to get the size. I think I used an 8? I honestly forget. 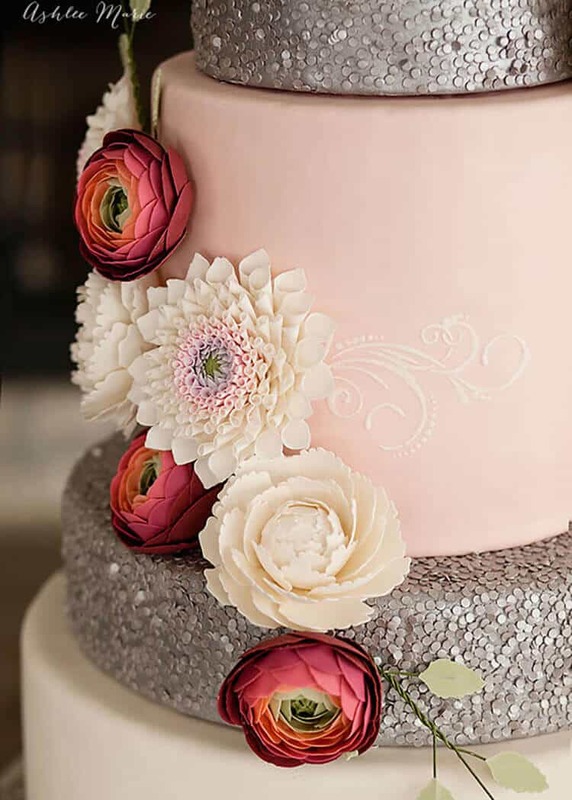 How would you ever charge for a cake like this to make it worth your “days” of cutting tiny circles? It is beautiful and I love the look but I don’t think I could ever make it worth my time. Never enough, certainly not here in UT where I can’t charge as much as I would in any other state! I did it because I loved the style and wanted to do one, but I would charge quite a bit (also it would go faster now that I know what style works best for me. Wonderful! Please, for next tutorial, any flower: ranunculus or dahlia. Thanks for sharing. working on getting the flowers up! Tutorials are always the most time consuming part, but I will get them up! What kind of airbrushing did you use? I love this method. What do you think about gold sequins? I have the gold airbrush color, but I don’t know what color fondant I should start with. To my knowledge, there is no “gold” fondant- But I suppose I can mix a whole bunch of colors together and hopefully get something that resembles gold underneath. THoughts? 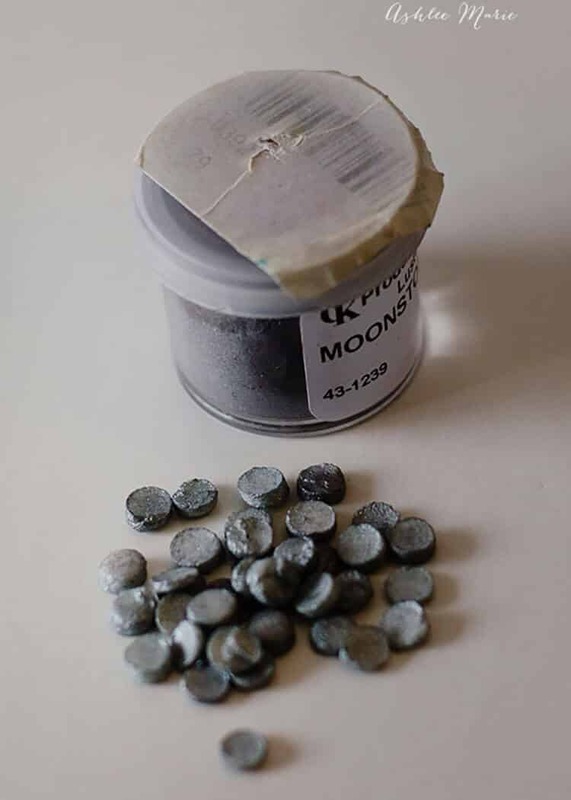 I totally have plans for some gold ones. I’m going to dye the fondant/gumpaste ivory first, then use the gold paint over the top! I tested out a few different ivory options already and I’m liking the results so far! I used a round frosting tip to cut them all out, whatever size you want, I believe I used a #8 for this cake. Your cake is beautiful! What sizes are your tiers? let me know if that works! it would be a time saver, i know some bakers use candy confetti, but it takes so much paint to cover the colors I didn’t love it. Hi , your cake is beautiful . And thanks for sharing. Which brand of gold/silver dust is safe to eat along with the cake ? Last year I made colorful sequins for cupcakes. I am Dutch and because I didn’t know this was called ‘sequins’, I had no luck finding online tutorials to make it. I came up a method myself that made a couple of sequins at the same time. What I did was binding a couple of straws together and dip it a few times in confectioners sugar. I rolled out fondant very thinly,sprinkled it with more confectioners sugar and pushed the handful straws in the fondant. The ones that were stuck in the straw, I gently pushed out with a long toothpick. 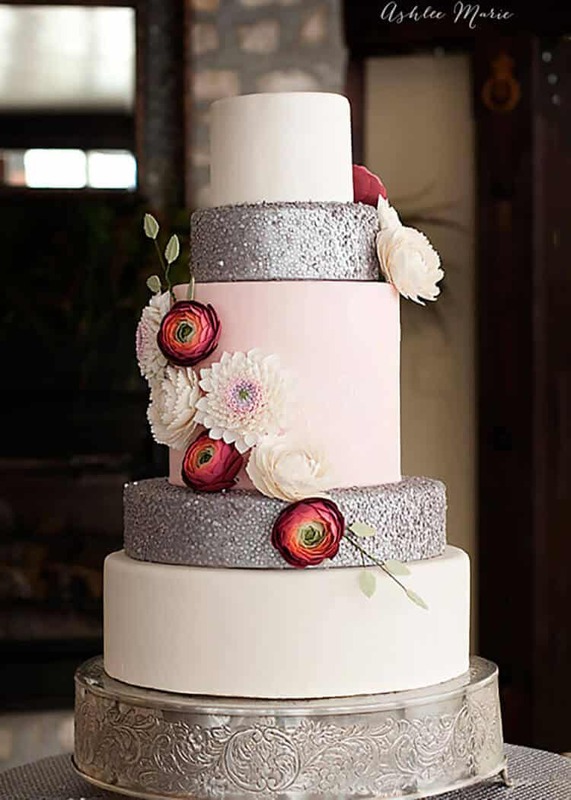 I recently did a small band of hand cut little fondant circles around a cake to get this look. It took me a day and a half to cut out those little circles. I watched an entire season of Oz. But dang, did it look awesome. My hand hurts just thinking about it, though! right!!! SO LONG but so worth it. I have a quick question- I try to stay away from Fondant, could someone (me) just stick these (or the edible confetti) to buttercream? 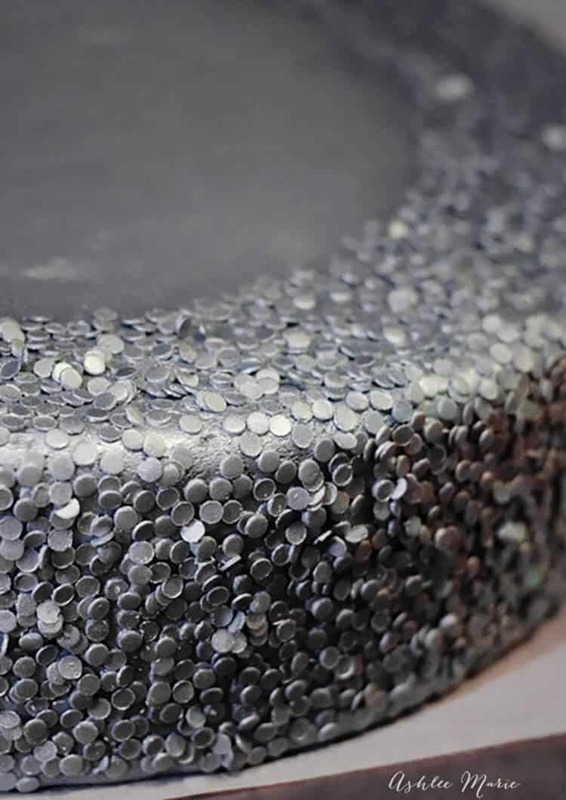 I’m not sure they’d stick good enough – I mean they’d stick in the buttercream but they’d need ot be pressed in quite a bit – and it wouldn’t look the same as the coverage you get this way – lots of buttercream gaps – also while you can paint the sequins it doesn’t stick quite the same way to the buttercream. 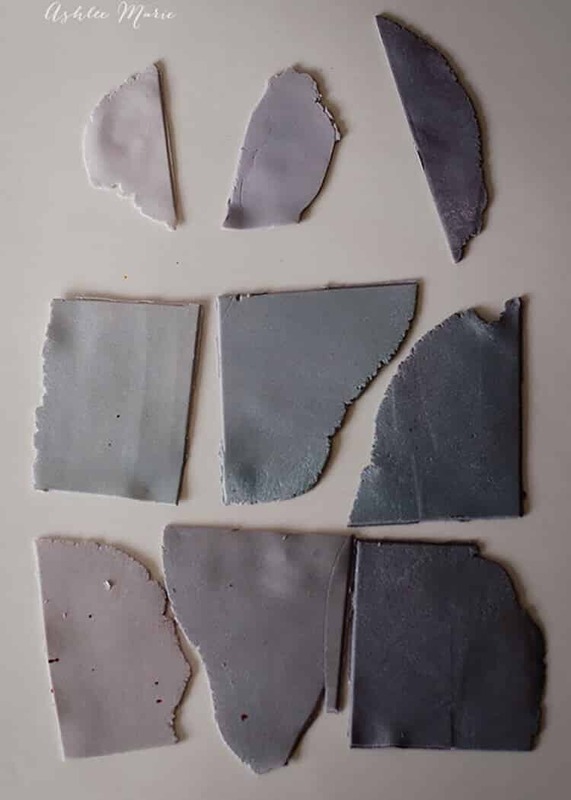 I don’t like to eat fondant – which is why most adults peel it off – but it’s simply better for for a ton of looks and techniques. I guess I feel good I wasnt the only “crazy” one to cut her own sequins 🙂 but I gave up after an hour and went to a local store and bought colored sprinkles. They’re not expensive, and it goes so much faster, you only need a lot of silver/gold to cover it. After I airbrushed with gold I had to handbrush it also.